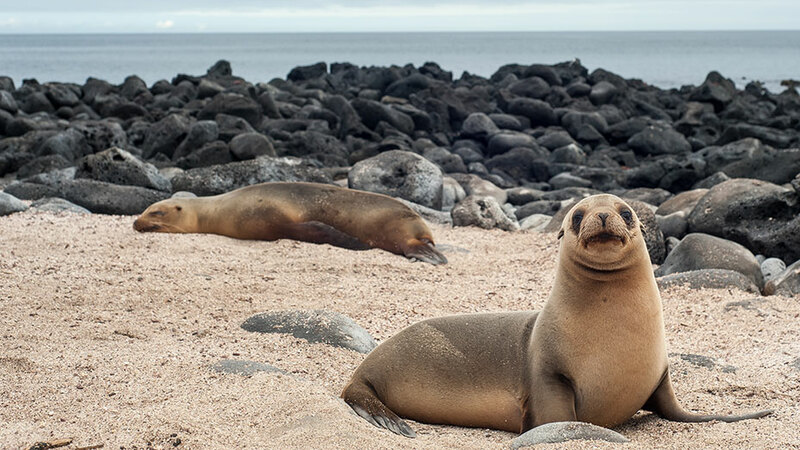 Although the great majority of Galapagos visitors come here to observe and appreciate natural wonders, you can also learn how is manage the protection and conservation of the islands. 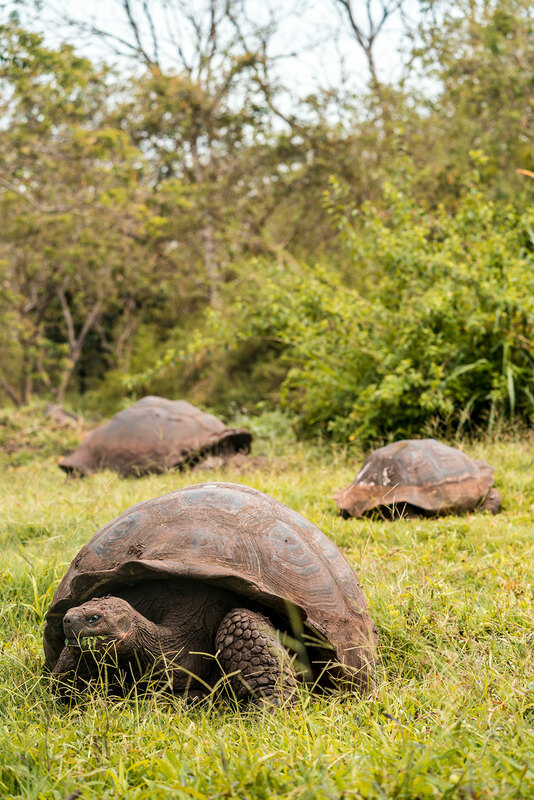 The main attractions are the National Park information center, the Van Staelen Exhibition Hall, the Breeding and Rearing Center for young tortoises and adult Galapagos tortoises in captivity. A delightful place reached by a nice zodiac ride. “Tintoreras” are small islands in front of Puerto Villamil coast. There is Heron lava on the lookout on mangrove branch, and Galapagos Penguin and sea lion often pop out on shore. 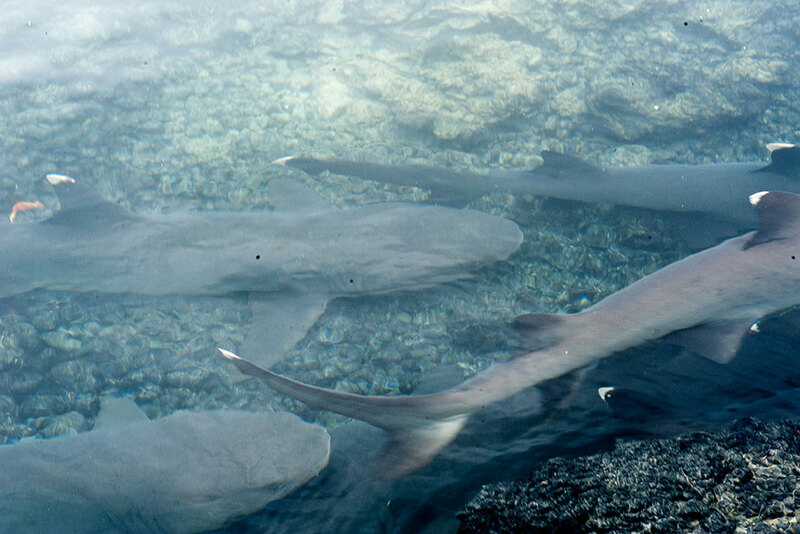 White-tipped reef sharks are fairly common in the archipelago. Their name in Spanish is Tintorera, in fact, this is the name of the site as well. They are always here resting in the shallow waters. Fernandina is the third largest island in the archipelago and has a single visitor site: Punta Espinoza located at the northeastern tip of the island. 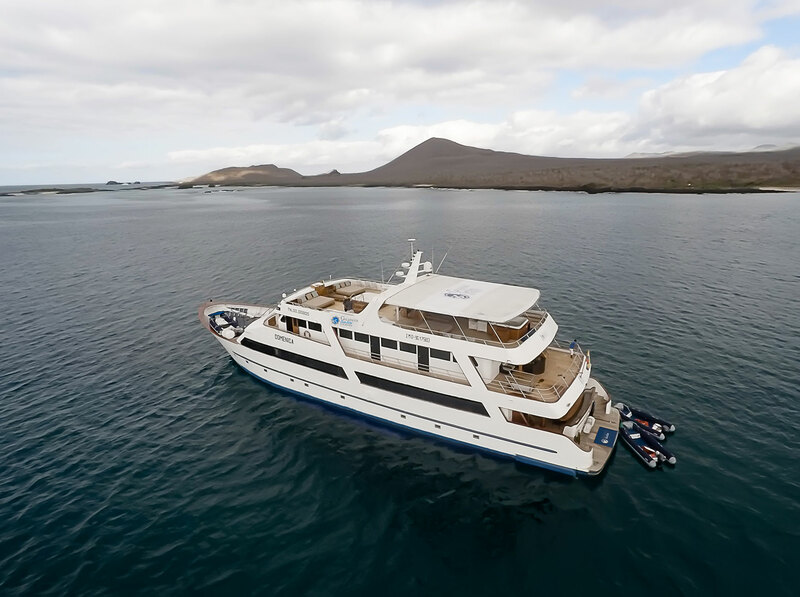 Just across Tagus Cove, you can see some of the unique species of Galapagos. 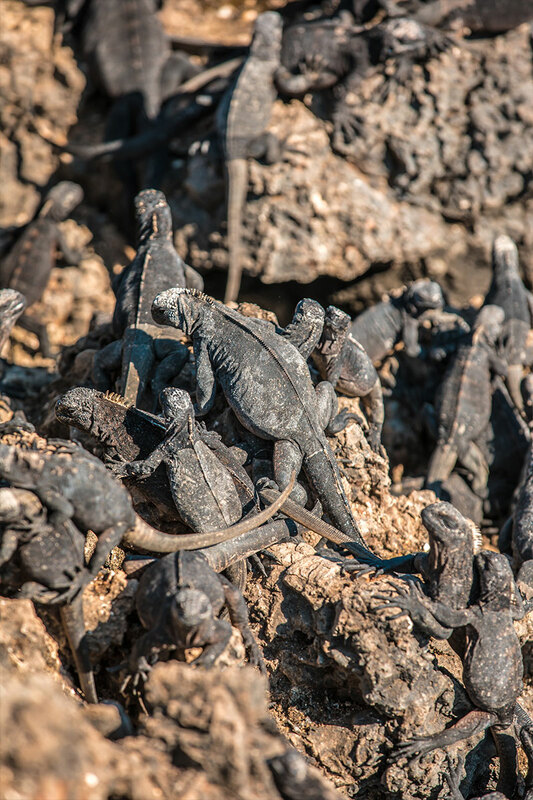 Marine iguanas conglomerate in larger groups than in any other island. They bask around in the sand, swim near the shore and sometime block the way at the landing dock. Among the unique species found here, is the Flightless Cormorant. A bird that due to the lack of predators, had to adjust their way of survival and improve their skills of finding food in the ocean. Their wings, tails and feet progressively adapted for swimming. To see these birds, is to witness evolution happening right in front of you. Stay within 2m of the cormorants and penguins. 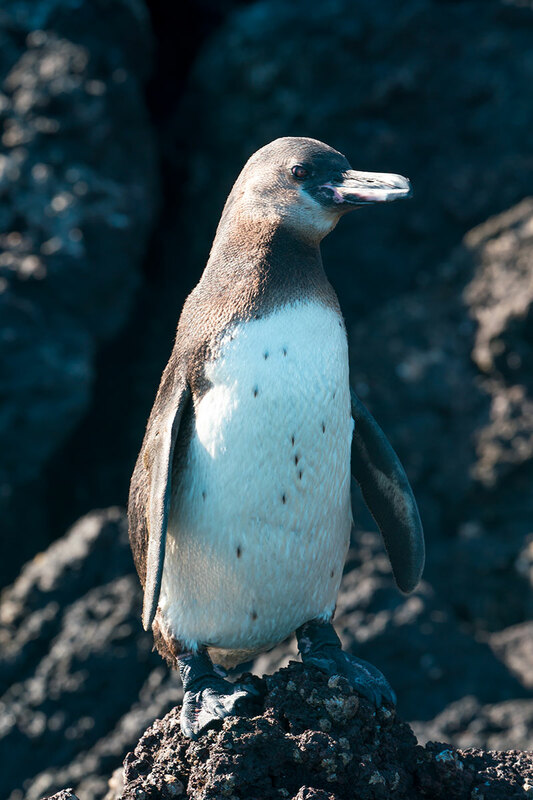 Tagus Cove, a tour along the cliffs in a zodiac will give the visitors a good chance to see the Galapagos penguin, the flightless cormorant and other sea birds. From the landing dock it is about a 30 minute hike along the trail up to the top of the cliff from where you can view Darwin Lake, an uplifted ultra-saline lake saltier than the sea. You can also see several volcanoes from this location. Look carefully at the graffiti on the surrounding cliffs of the cove; Pirates, whalers and buccaneers wrote them in past centuries. In northern coast of Santiago Island in James Bay, is Espumilla Beach. During the last presence the El Niño phenomenon, one of the two lagoons in this site, underwent a process of sedimentation, thus causing the disappearance of a representative colony of flamingos. The main attractions are the Palo Santo forest and the marvelous. The beach is an important site for nesting marine turtles. Its black beach is located at the west side of the island and is the main attraction of the island. Their volcanic tuff deposits formed this special black sand beach. This site is called Puerto Egas, because there was an attempt of company of Hector Egas, to start the exploitation of salt, which failed because the price of salt in the continent was very cheap and did not justify its exploitation in Galapagos. They abandoned the project and they left their infrastructure. In the afternoon, you will visit Puerto Chino. It is rife with huge cactus over the trail like trees. 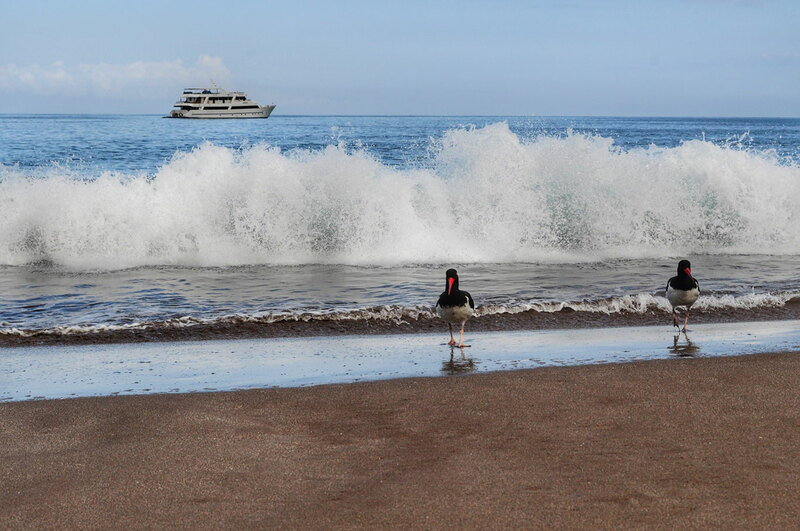 Once you get on the beach, you will enjoy its surroundings with its wildlife. Sea lions share the beach with people so its common see the puppies playing and swimming. Enjoy the deep blue waters with the waves and tide, occasionally there is wildlife to see, especially tortoises. After, you will visit the Breeding Center Jacinto Gordillo, also known as the “Galapaguera” is a good place to observe Galapagos tortoises in its natural habitat. San Cristobal island has endemic species such as: The Mockingbird Nesomimus Melanotis, lava lizard (Microlophus Bivittatus), Chatham Leaf-toed Gecko (Phyllodactylus Leei) and the tortoises. All of these species can be observed in this place, the beach is really big, and it works as a nesting zone for marine tortoises. 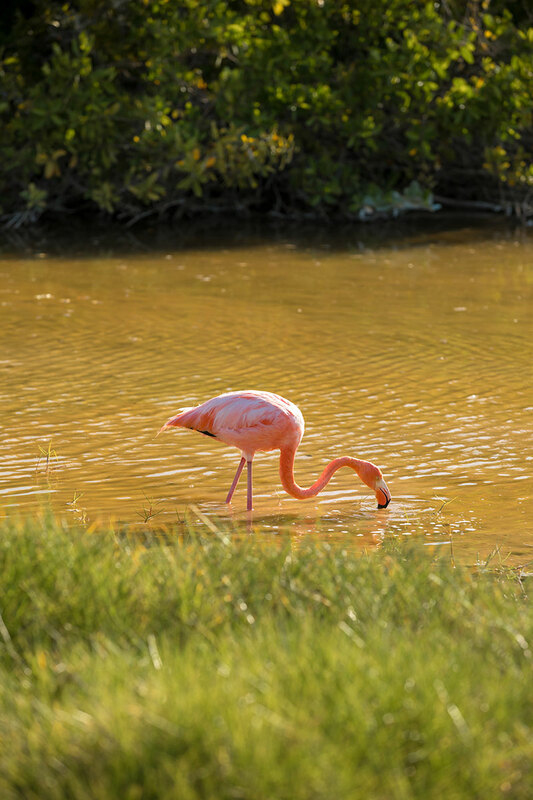 This site offers probably the best Flamingo lagoon in the Galapagos; it is also one of the largest in the islands. It’s situated between two tuff lava cones that give the area a special atmosphere. There are various species of shorebirds to observe besides flamingos; the most frequent are common stilts, white-checked pintail ducks as well as other migratory birds. It is very interesting to see the two distinct beaches: “The Green Beach” (due to its high percentage of olivine crystals in the sand) and the “Flour Sand Beach” which is made up of coral. Historically, this site is the location of a wooden barrel that was placed in the 18th century by the crew of a whaling ship. It has been used since this time by mariners and tourists as a post office. The idea is to carry letters or postcards to their destination by hand. Apart from being the Post Office Barrel, this site was the landing area for some of the first colonists. We will continue to the north of the island and will visit the Baroness Bay, here we will have the opportunity to Kayak and explore the inlets where seabird nesting sites and sea lion colonies can be found. It is said that Baroness Eloisa von Wagner loved this place and spent several hours watching the horizon. 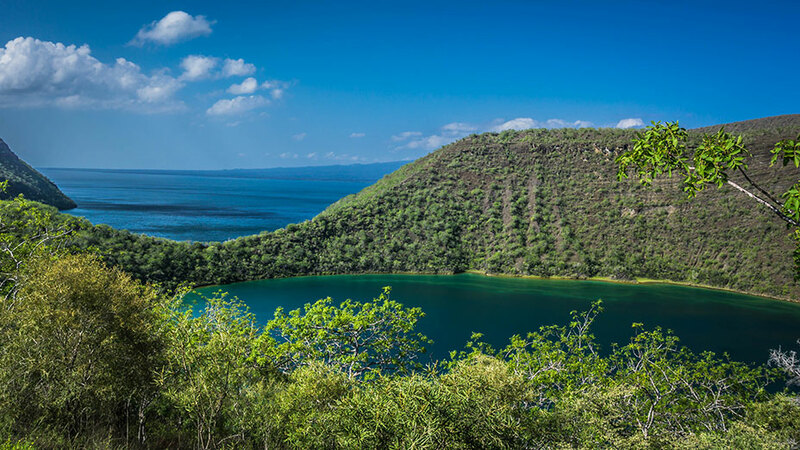 It is a beautiful bay that allows to breathe in the coastal and volcanic scenery. You will enjoy amazing views from the Sea Star sundeck covering the scenery from Enderby islet to Post office bay, Cerro Pajas, the pool of flamingos and wide forest of Palo Santo. In the southeastern part of the Galapagos, is Santa Fe. This island was formed from an uplift instead than a volcanic origin, this is why is mostly flat. There are some theories which assure this could be the oldest island in the Archipelago. 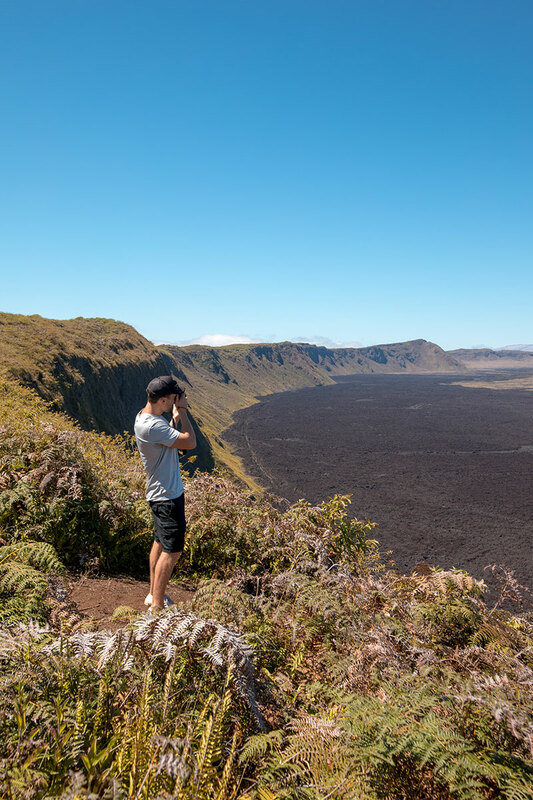 Santa Fe is the home of a number of endemic species like the Galapagos Hawk, Galapagos snake, Galapagos mockingbird, rice rats and one of the two species of lands Iguanas of the islands. After disembarkation in the beautiful and clear waters you will be in contact with one of the many sea lion colonies. Along the trail, you can see many salt bushes as well giant Prickly pear cactus, gigantism is a characteristic of oceanic islands. 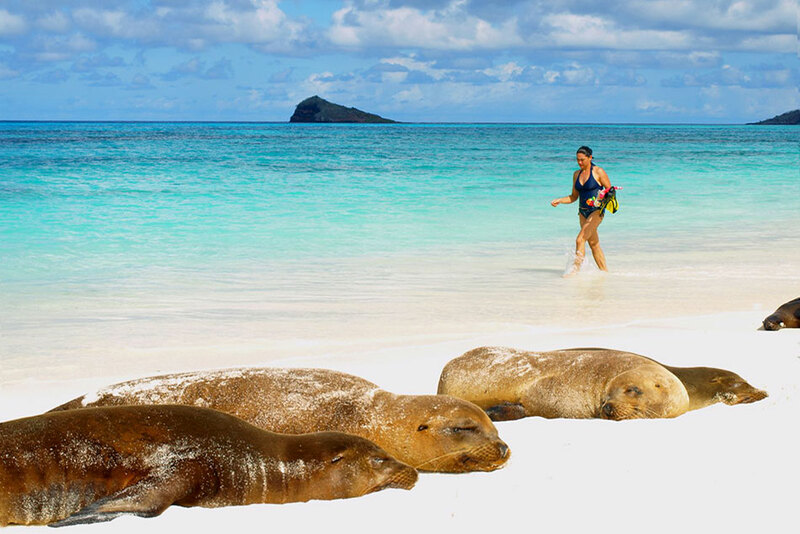 There are great possibilities of snorkeling with playful sea lions and tropical fishes. At the east of Santa Cruz, is Plazas. 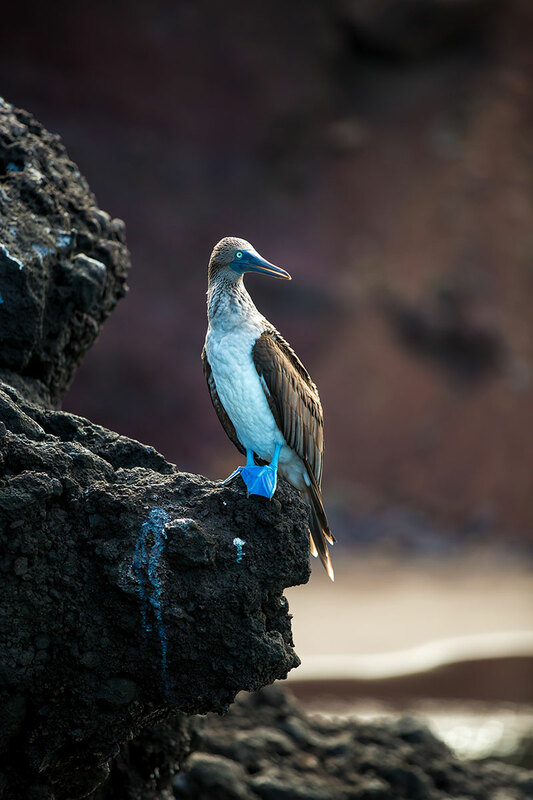 Despite its small size, you can find here some of the most interesting and outstanding species of the Galapagos. In fact, the Plazas land iguanas are smaller than its relatives found at other islands. Throughout the island there are several hybrid iguanas. For example, a crossing of male marine iguana and a female land iguana, they are unique. As a result, they are recognizable at first glance by their black/gray color, with a land iguana’s crest, but face and tail of the marine iguana. The big population of iguanas is due to the presence of tunas, their favorite food. Swallow Tailed Gulls nesting in the rugged cliffs are seen along with other sea bids as: Audubon shearwaters, red-billed tropicbirds, frigate birds and brown pelicans. Seymour is an uplifted (as opposed to volcanic) island and so is generally flat and strewn with boulders. There are good nesting sites here for a large population of magnificent frigate birds. Blue-footed boobies perform their courtship dance in the more open areas and swallow-tailed gulls perch on the cliff edges. Despite the tremendous surf that can pound the outer shore, sea lions haul out onto the beach and you can see them surfing. Watch your step, as the boobies don’t worry much about where they nest, and you might just step on one. In fact, the trees have many male frigate birds trying to attract the attention of the ladies by inflating their bright red skin flaps. They sometimes fly in the air to call more attention to themselves. There’s a circular path that takes you through the island to a beautiful, rocky shore where the waves crash a silvery-blue. These two small islands are in the West of Turtle Cove. Their sand is made of decomposed coral, which makes it white and soft, therefore, it is a good place for the sea turtles nesting site. Behind one of the beaches, there is a small brackish water lagoon. Here is possible to observe flamingos and other coastal birds, such as black-necked stilts and whimbrels. The other beach is longer, and you can see there two old Second World War barges when the USA used Baltra Island as a strategically point to protect the Panama Channel. 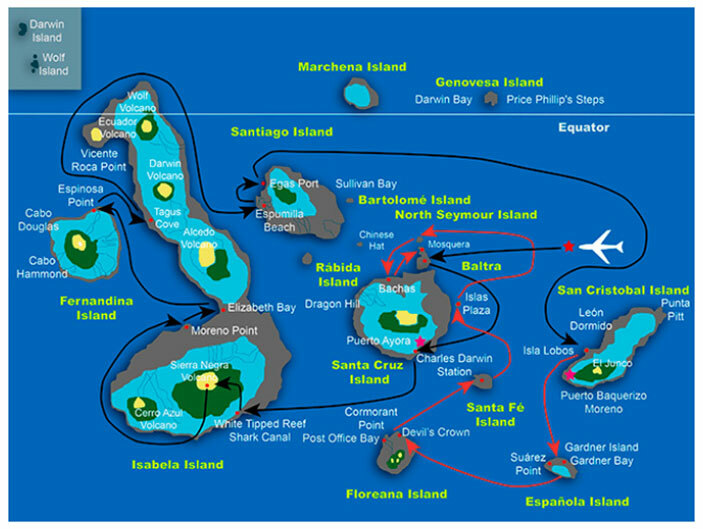 The location of Mosquera Islet is between Baltra and North Seymour Islands. A geological uplift formed this islet, in its narrowest width reaches 160 meters approximately. This islet has one of the largest populations of sea lions, visitors can also observe several species of shorebirds. Thus, if you are lucky you can see dolphins and orcas around this islet. After this activity, you will go to the Baltra airport for your flight back to the mainland.